Frontline® Plus disrupts the flea life cycle to kill all stages of fleas on cats and dogs. Also kills ticks. 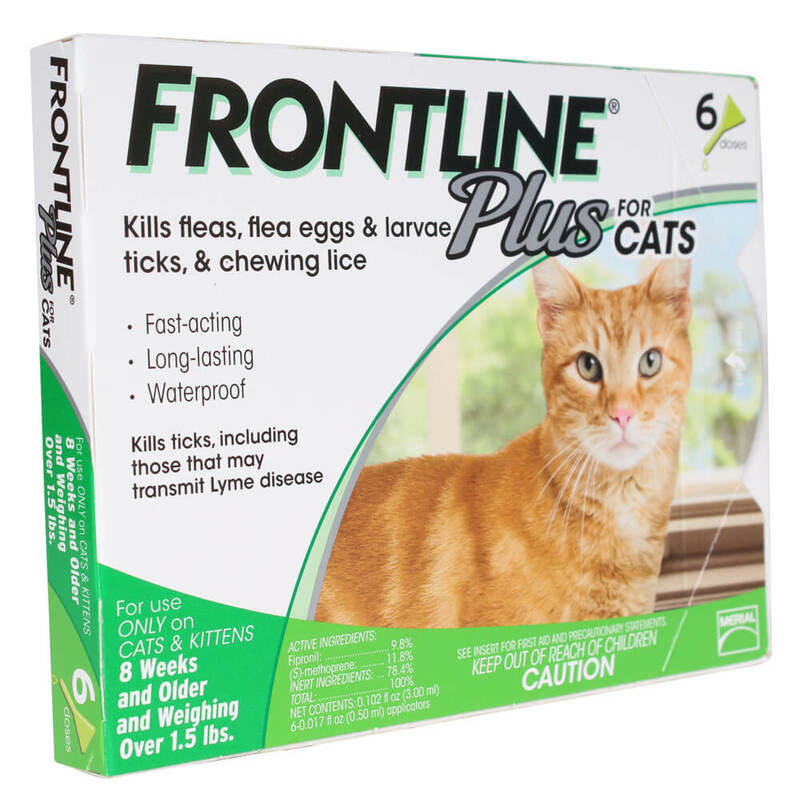 FRONTLINE® PLUS FOR CATS contains fipronil and the insect growth regulator (IGR) (S)-methoprene. FRONTLINE® PLUS effectively targets all stages of fleas. Fipronil collects in the oils of the skin and hair follicles, and continues to be released from hair follicles onto the skin and coat, resulting in long-lasting activity against fleas, ticks and chewing lice. Getting rid of fleas and ticks with Frontline Plus is easy and effective. This product contains chemicals including, Ethanol, which is known to the State of California to cause cancer, birth defects or other reproductive harm. (California law requires this warning to be given to customers in the state of California) For more information go to www.P65Warnings.ca.gov. We had a flea infestation after sharing a cat carrier with a family friend. 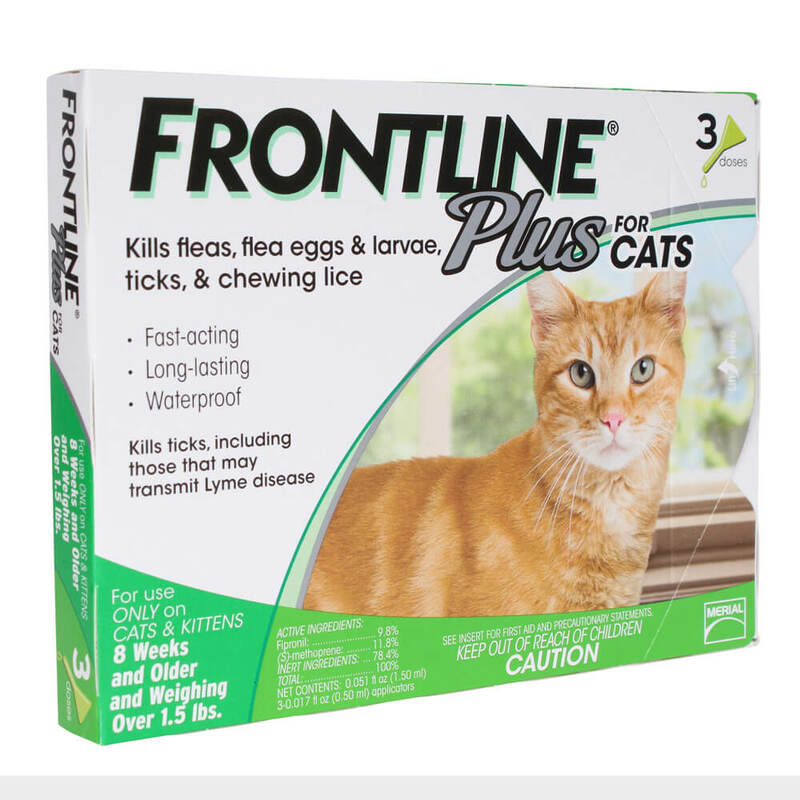 Regular use of Frontline plus put a stop to flea on my two cats. To kill fleas, and all stages of brown dog ticks, American dog ticks, lone star ticks, and deer ticks (which may carry Lyme disease) and chewing lice, apply to cats and kittens (8 weeks or older) as follows: Remove applicator from child-resistant package. Hold applicator upright and snap applicator tip away from face and body. Place applicator tip through animal's hair to the skin level between the shoulder blades. Squeeze applicator, applying entire contents in a single spot to the animal's skin. Avoid superficial application to the animal's hair. Only one applicator per treatment is needed. For external use only. Do not use on kittens under 8 weeks of age. Individual sensitivities, while rare, may occur after using any pesticide product. Pets may experience some temporary irritation at the site of product application. If signs persist, or become more severe within a few days of application, consult a veterinarian immediately. Certain medications can interact with pesticides. Consult a veterinarian before using on medicated, debilitated or aged animals. Call 1-800-660-1842 for 24-hour assistance.